Widespread advanced use of mobile phones in Japan has not come about serendipitously: the Japanese have taken to their cell phones because of the country’s highly advanced mobile phone technology and network infrastructure. Additionally, the government’s ambitious strategic plan to make Japan the most advanced “e-nation” in the world has boosted the industry, created an ideal environment for promoting mobile phone usage beyond simple person-toperson calling, and spurred domestic demand for high-tech handsets. With widespread access to fast and low-cost broadband networks, Japan’s mobile phone industry boasts some of the world’s most advanced mobile phone technologies. The mobile phone, or keitai, is rapidly linking users’ everyday needs to virtual applications. For example, most mobile phones are able to download train schedules, receive personal health biofeedback, execute banking and other financial transactions, play games, display digital/terrestrial TV and full length novels, and even find temporary employment for its owner via a GPS-linked application. The latest offering by NTT DoCoMo, the largest Japanese mobile phone carrier with more than a 50 percent market share, is the new MH2H, or mobile home to home technology. The technology allows the user’s handset to stream content from the user’s home PC to a remote TV at a friend’s home or another office. The Ply Phone, a prototype designed by KDDI, may incorporate advanced features such as a mobile projector, color photo printer, game controller, and such quintessentially Japanese features as a tissue or mint dispenser. A distinctive feature of Japanese mobile phones is the use of thousands of pre-installed icons and characters including “emojis,” “animes,” and “emoticons,” used extensively in mobile communications. The predominant use of the emojis and a new mode of slang called “gyaru moji” by school children, combined with the Japanese penchant for texting, has shaped a web-savvy youth culture that considers anyone unfamiliar with it as “kuki yomenai,” or unable to read the air around them. 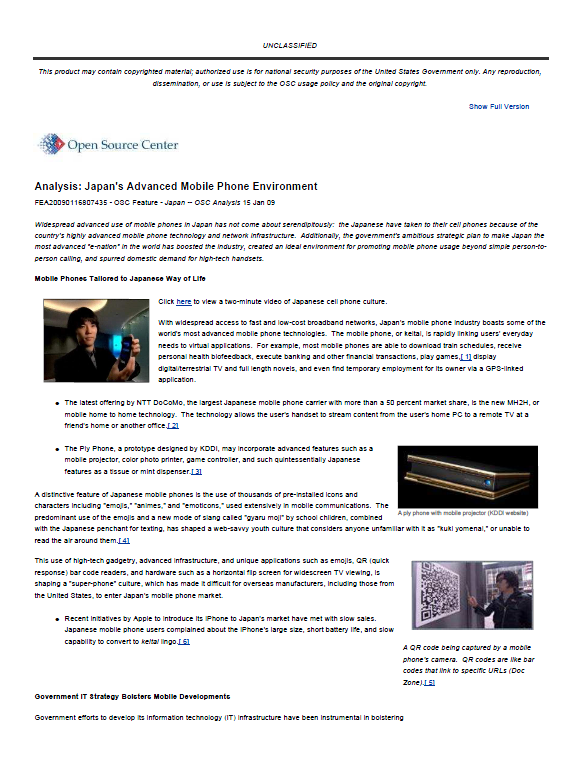 This use of high-tech gadgetry, advanced infrastructure, and unique applications such as emojis, QR (quick response) bar code readers, and hardware such as a horizontal flip screen for widescreen TV viewing, is shaping a “super-phone” culture, which has made it difficult for overseas manufacturers, including those from the United States, to enter Japan’s mobile phone market. Recent initiatives by Apple to introduce its iPhone to Japan’s market have met with slow sales. Japanese mobile phone users complained about the iPhone’s large size, short battery life, and slow capability to convert to keitai lingo. While some observers might attribute the widespread usage of mobile devices in Japan to cultural phenomena, such as reliance on public transportation giving the average Japanese commuter more time for personal communication, a study by Infinitia, a telecommunications market research company in Japan, attributes the strength of the market solely to technical reasons. Government subsidization: Since the government charged no spectrum licensing fees, network operators realized a profit after recouping their investment in network infrastructure. that can be accessed by all mobile users and lead to more widespread adoption. Operators pay content providers generously, creating an incentive to produce a constant supply of fresh content, attracting users. is more versatile and provides richer content than Simple Messaging System, or SMS. without fear of hidden fees. Government efforts to develop its information technology (IT) infrastructure have been instrumental in bolstering Japan’s mobile industry. According to a Japanese Ministry of Internal Affairs and Communication white paper and online trade media sources, after an economic downturn a decade ago, Japan’s government initiated a plan to provide a variety of government incentives to industry to create what the government believed would become the most advanced e-nation in the world. These incentives included funding, human resources, technical assistance, tax relief, and subsidies for start-ups and ventures. In addition, the government deregulated the industry and has removed many obstacles to domestic competition. The government five-year plan, “e-Japan Strategy,” began in 2001. In 2003, the strategy was further defined, stating that government, industry, and academia should cooperate so that Japan’s new IT society “does not simply follow the West and can be transmitted as a model to the whole world.” In 2004, the Japanese Government revised telecommunication business laws to promote deregulation of private carriers.